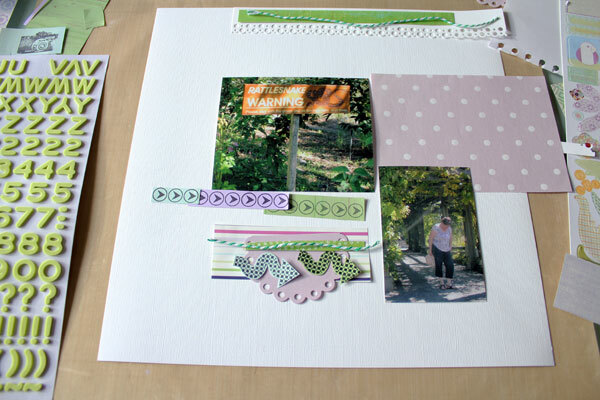 Twelve months ago I embarked on the process of making a scrapbook layout a week and sharing the process of making the page from start to finish here on the blog. You can see all the layouts here. 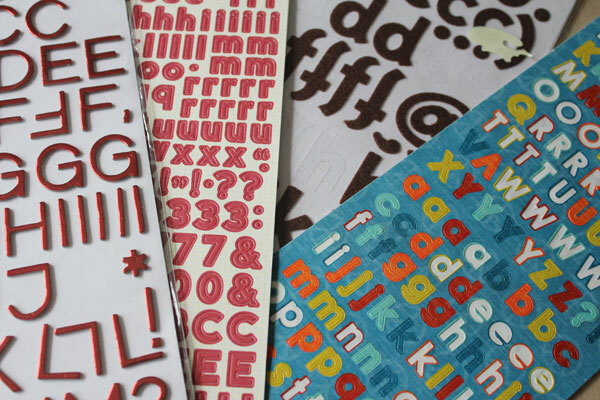 I hoped to learn about why I choose designs and styles and grow from that knowledge. I’ve been thinking about this challenge and whether I have been succesful or not and what I have learned through the months. 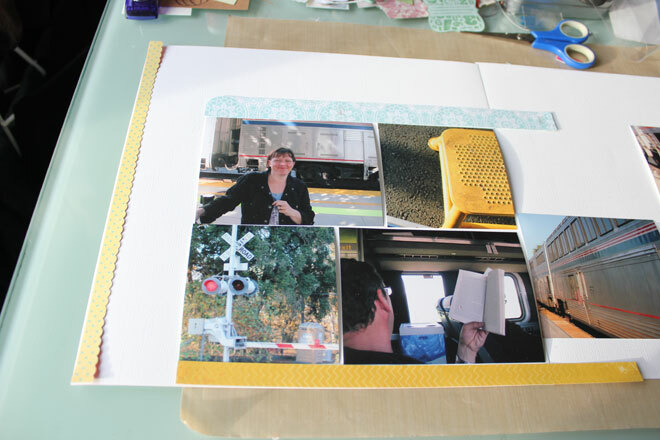 My initial thoughts were of my failure to make 52 layouts but I put that aside and focussed on the positive. 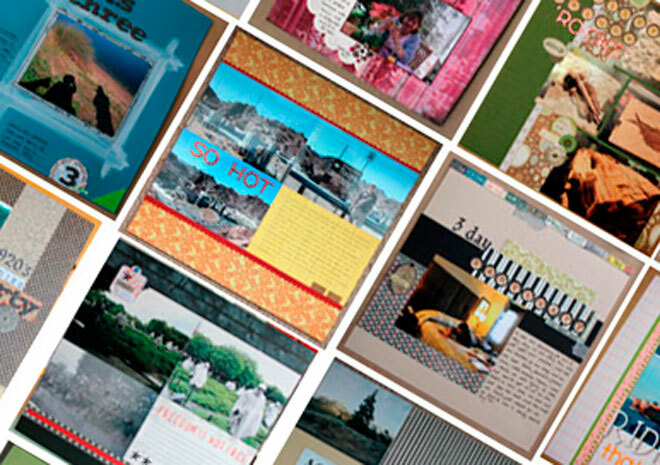 I made 41 layouts for this project and a few more along the way and that is a great achievement. 41 stories told last year. I have other negatives, well not so much negatives but observations about the mechanics of photographing my creative process. 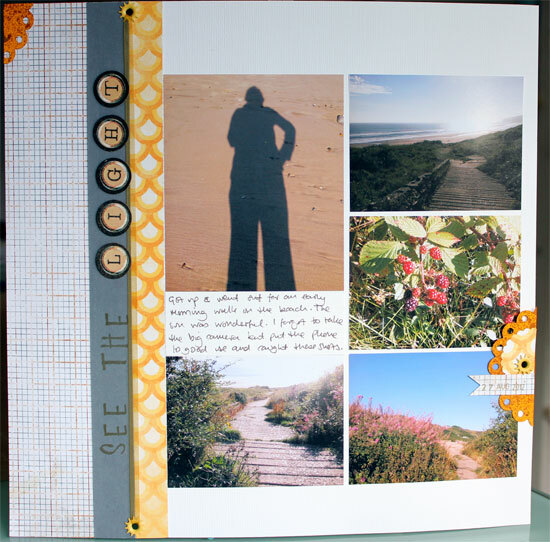 The very act of stopping to photograph each step challenges the creativity and I take my hat off to all those amazing blogger/scrapbookers out there who do this week in and week out. 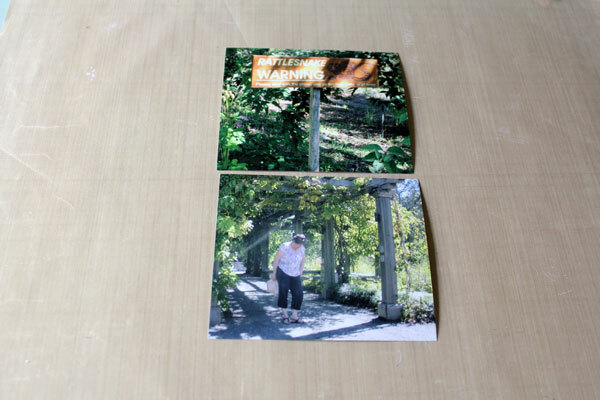 I did not find a rhythm for taking the photos of each step and probably every week had a trauma about getting the photos taken, usually due to poor light. The biggest thing I think I have learned is that although I like a clean and simple look I also like artsy messy looks too. 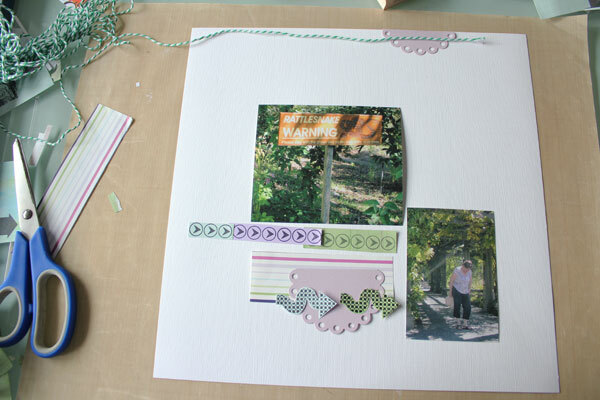 That I will always struggle to get started and often need inspiration from other layouts to help me along the way. Overall not really a success in terms of changing the way I scrap but what I intend to do this year is keep making layouts and keep sharing the end result here and I’m hoping that without the pressure of getting each step of a page photographed I will find the creative path that the weekly layout helped hone. Let’s get the story told and the rest will follow. 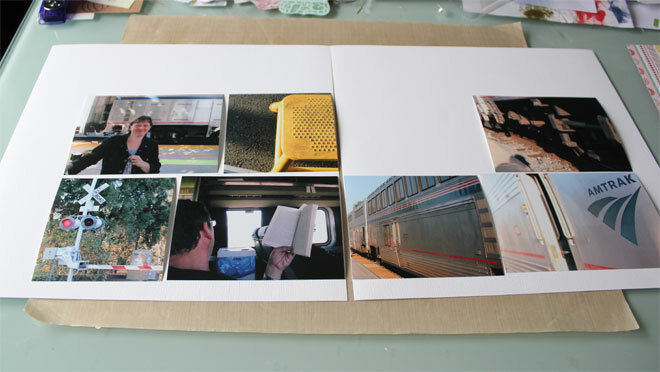 Welcome to the forty second layout in the series. Not a California layout this week but a little story about Buddy. A photo from last year was a good one to use because a) I love this photo and b) it captures that butter wouldn’t melt quality he possesses. I picked a few papers out, I always tend to go for bright colours when scrapping Bud. 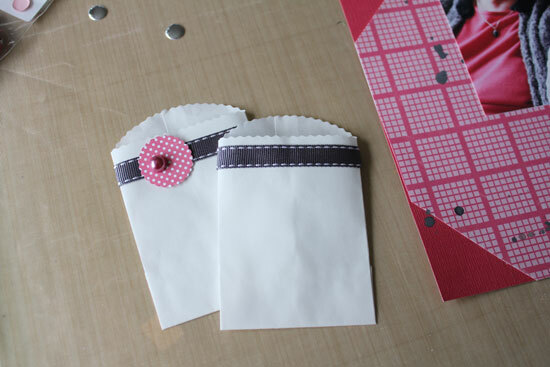 There were some little scraps of paper that I wanted to use up so I threw them in the mix too. Once the photo had been placed on white card there was no going back even thought that wasn’t my plan. 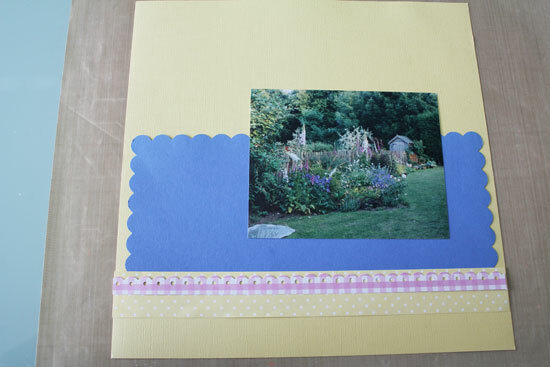 But I liked the look and attached the photo right at the top of a 6 inch strip of card. I placed a narrow strip of orange at the top of the page. The scraps were all rectangular in shape and the idea of building them up in a block just happened so I went along with that. Once the papers were in place I felt the page needed more balance at the bottom so I added another strip of the orange paper. I was bold with my title and added it right onto the papers. So unlike me. 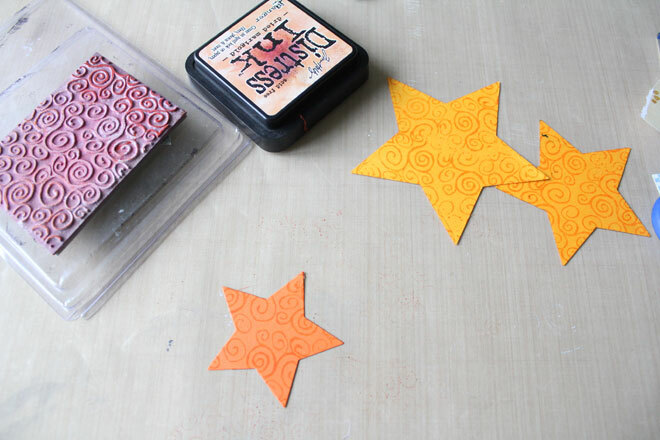 Three stars were stamped with Distress Ink and a lovely Tim Holtz swirl stamp. 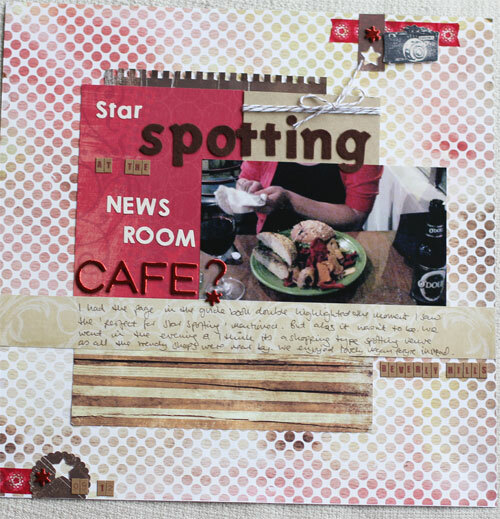 I put the stars around the page and added a little washi tape and the brads. The writing was added in a white pen the help the balance of the white around the page plus it shows up great on that blue. Cute and fun. And a lovely story about the Budster told. 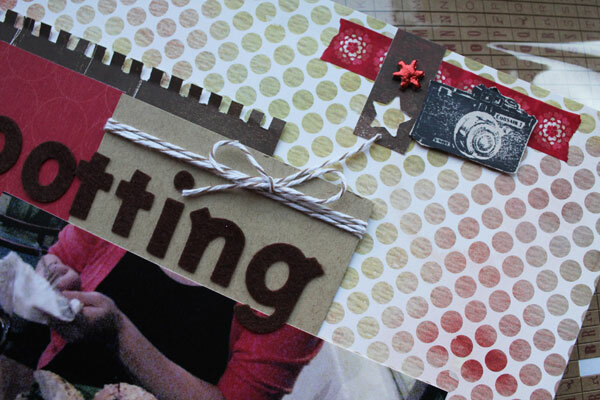 Weekly Layout is a series of blog posts that I am doing every week in 2012. 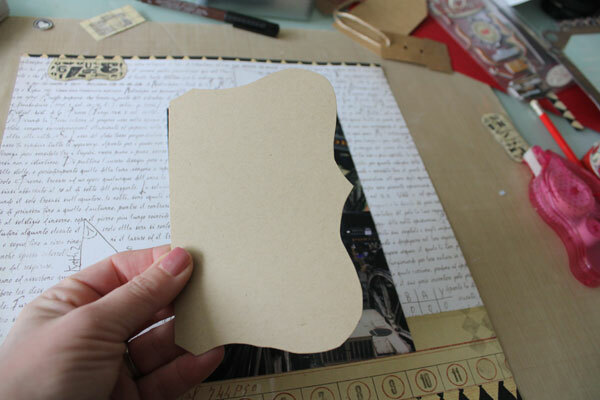 I am walking through the process of putting the page together with a bit of background to why I picked the design and embellishments for the page. I hope to develop my style and push myself by taking on this challenge. You can see previous weeks here. Welcome to week forty one. You guessed it – more California photographs this week. 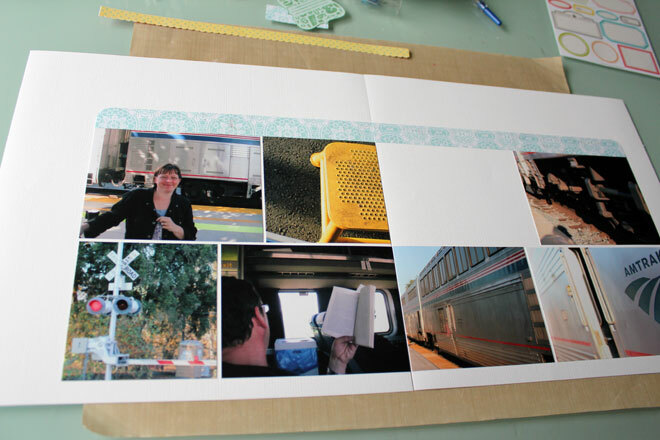 The story of our journey on the Coast Starlight. 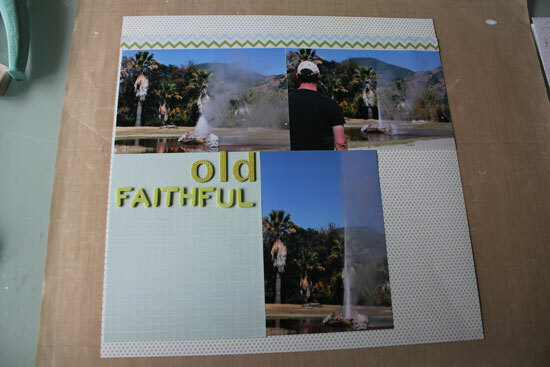 I wanted to use all the photos shown and knew they wouldn’t fit on one 12 x 12 but I cropped them a bit hoping to fit them on one page. 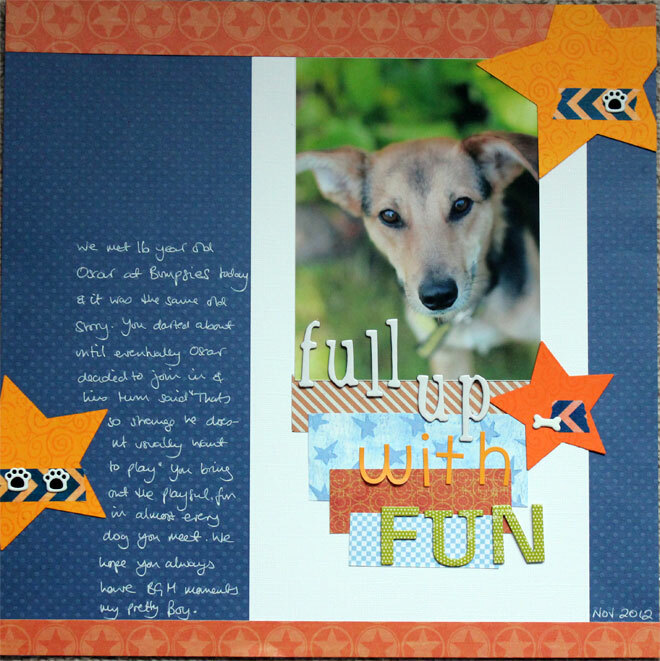 In the end I had to go with a double page layout. 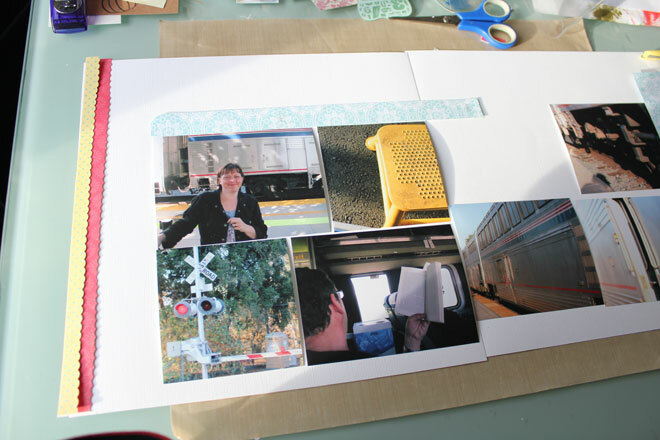 I laid the photos in a grid leaving a blank space for the journal block. 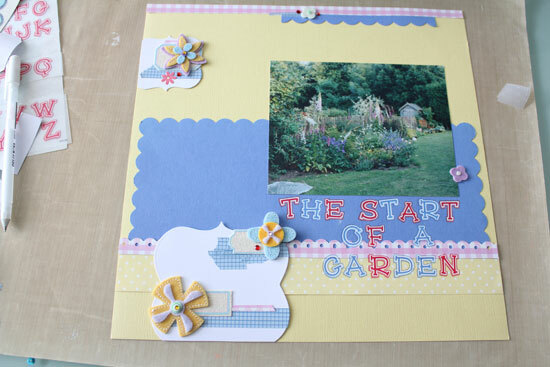 That yellow footstool step spoke to me as a colour for the layout, which is unusual as I’m not a yellow fan but I managed to find some yellow papers along with a lovely floral and some blues and greens. 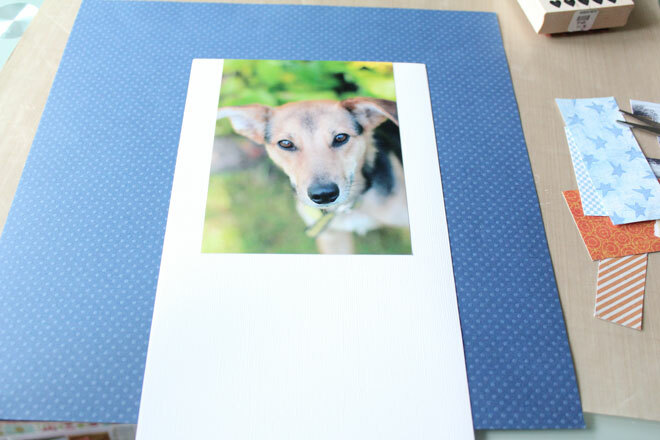 I cut two strips of the blue pattern and put them at the top of the photos rounding the corners. I tried a couple of combinations of colours on that left edge. 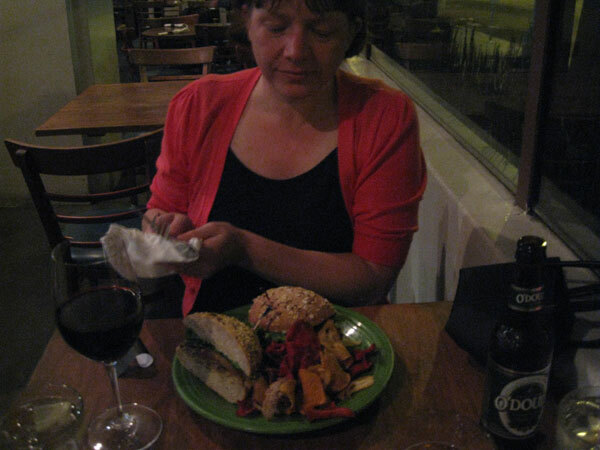 And considered adding a strip at the bottom of the photos too. 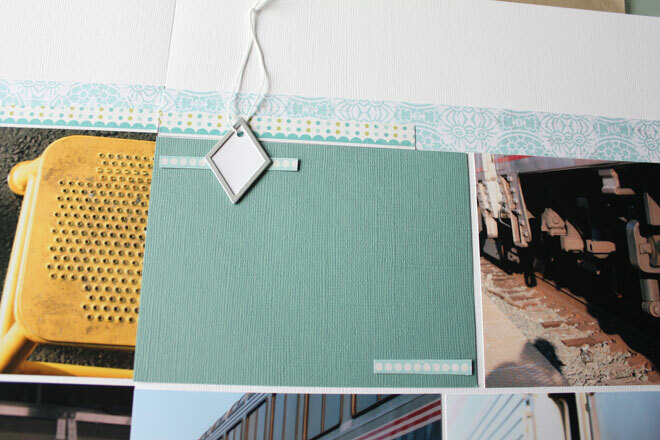 I cut a journal block and added a couple of tiny pieces of card and a metal tag. 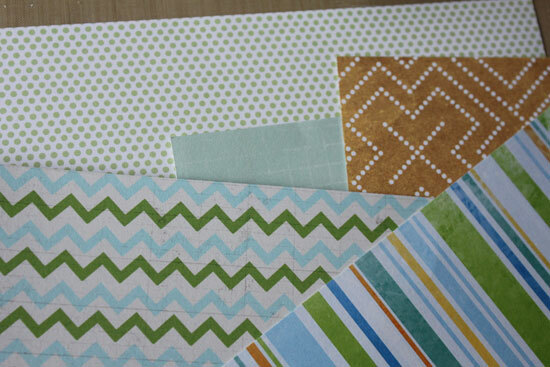 I also popped another strip of patterned paper onto the top blue strip. 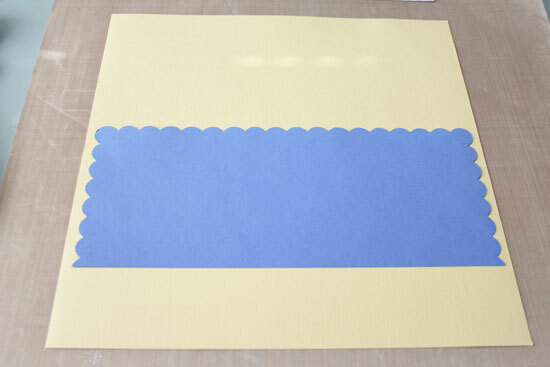 To balance the page I cut a shaped piece of cards from the blue paper and added it onto the left of the page. The story war stamped on the tag and I added the writing onto the card. I got to this point and realised I hadn’t even thought about a title. So I added that with lime green Thickers. 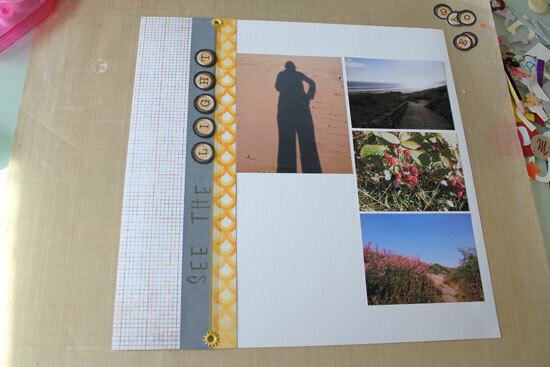 Finally I added another little cluster of embellishment at the top right which included yellow labels from October Afternoon and that was the pages finished. 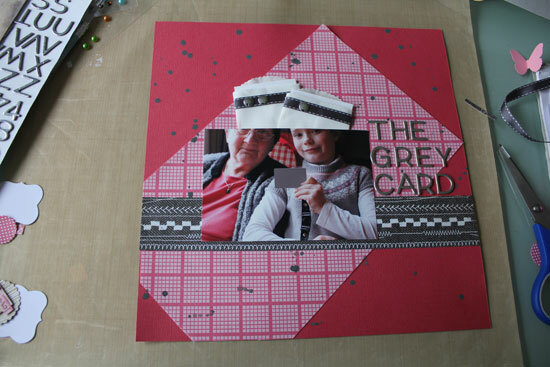 As usual with the white card background the layout ended up being very minimal. But that’s the way I seem to like it. Dare I say more California photos this week? Well it is. I just love being so inspired by photographs so am grasping the feeling with both hands. Another funny little story this week. 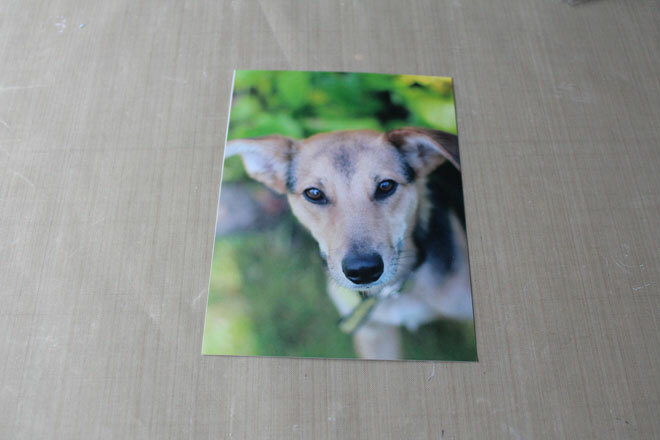 Here are the photographs. Taken when we visited Quarryhill Botanical Gardens near Glen Ellen they show the rattlesnake warning sign and my sandals. You don’t usually have to worry about rattlesnakes in the UK so I was somewhat worried about my tootsies. 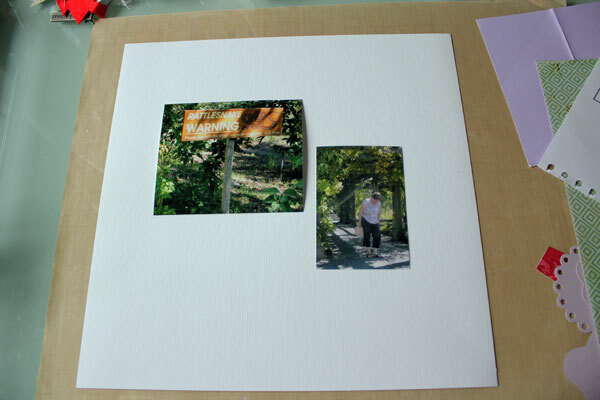 I used white cardstock for the background and trimmed the photos to form a loose ‘L’ shape. 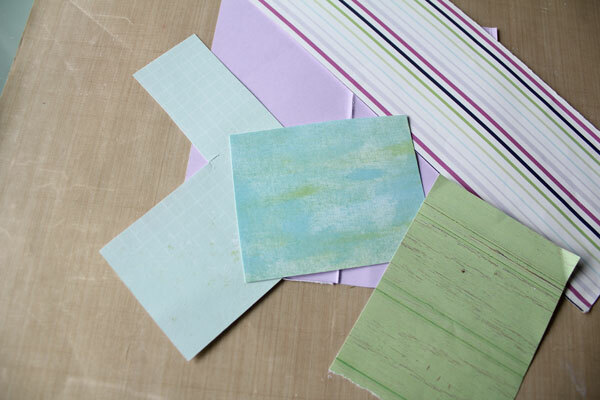 Then I picked some scraps of paper to coordinate with the green foliage and my lilac and white top. 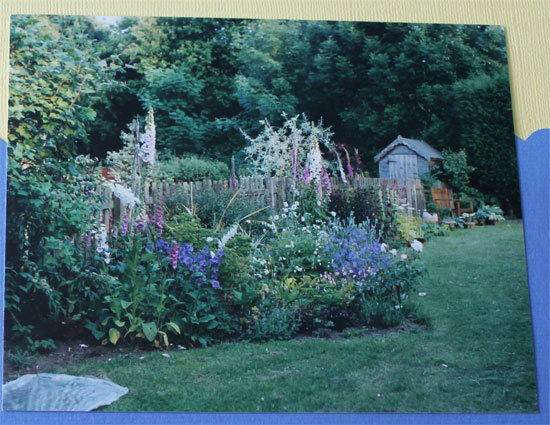 The photos were of a sunny scene (shady but sunny) and I thought the white green and lilac accented that as well as going with the photos. As the shoes were important I wanted to highlight them and thought and arrow stamp might work well. 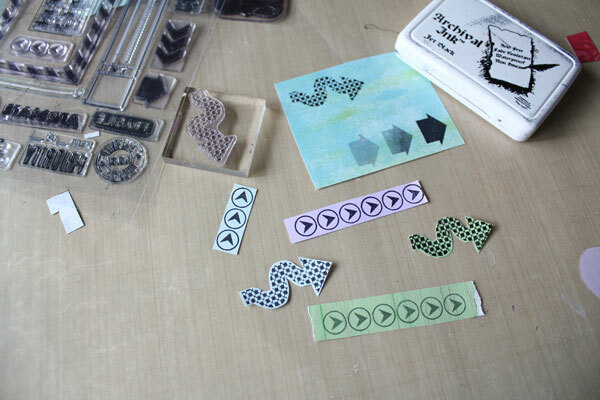 I stamped various arrow stamps (from a 7 Gypsies set) onto the papers with black Archival ink and trimmed the out. The stamp with the circles looked great in those three colours so I left them as they were and added them under the top photograph. I even went crazy and pulled out the sewing machine for a different look this week. 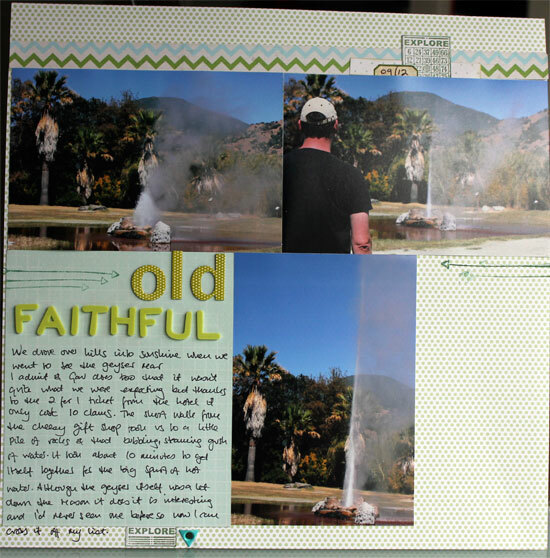 I placed the photos back on the page along with a few other embellishments to see what I thought before adhering anything else down. 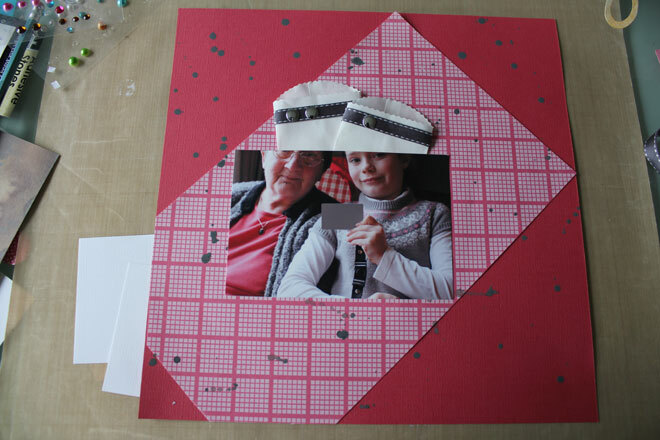 This seemed okay but that gap above the bottom photo bothered me so I tried a lilac spotty paper to see. 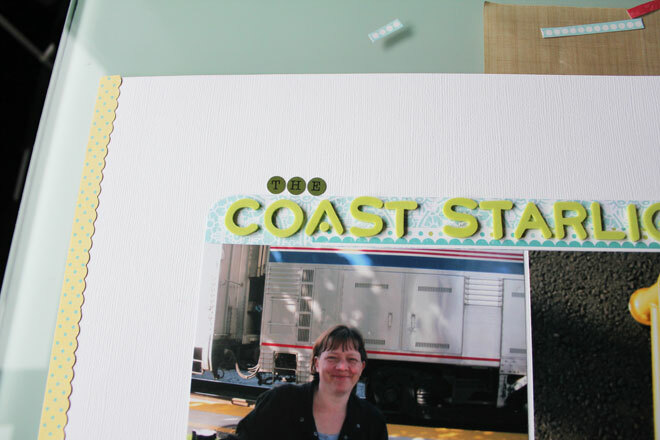 I also added a splash of green paper at the top and a punched border. 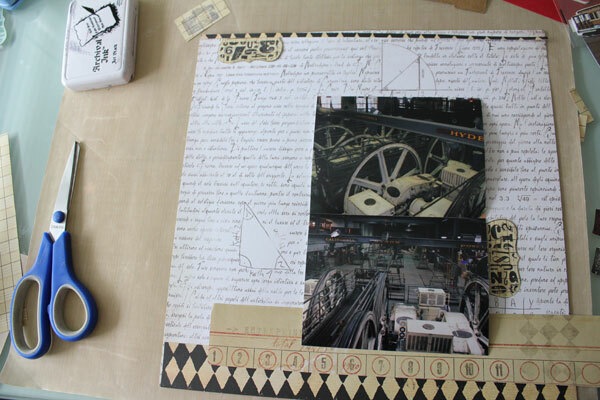 But went back to the original plan and decided that the space would be filled with journalling and look okay. So I went ahead and added the title and adhered all the elements to the page. I love the rub on font for the ‘shoes’ it looks like bamboo and thought it went well with the subject matter. Here is a closer look at the grouping under the photo. 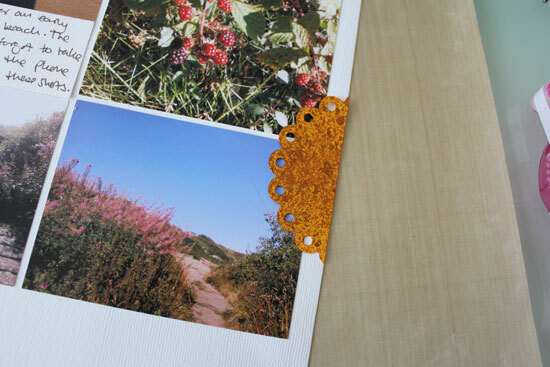 I stitched them together then stapled the bakers twine in place before adhering to the page. Added the writing and a little stamp of bare feet that I adore and thought it was a funny accent and the page was finished. Not so clean and simple this week but still great oh yes and that camera stamp made it in again. Another holiday story this week. Here’s the photo. 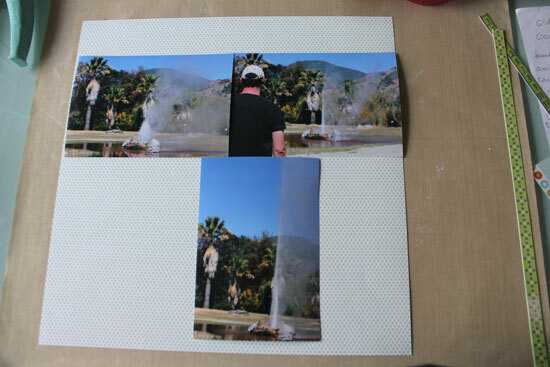 You’ll see that I cropped and altered the photo quite a bit before I printed it out. It was grainy to start with so I enhanced the grain to make it look intentional. 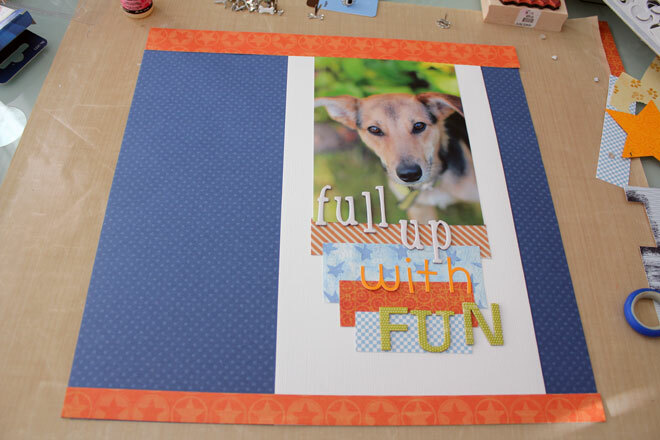 The basic layout for this page was taken from a video over at Two Peas. 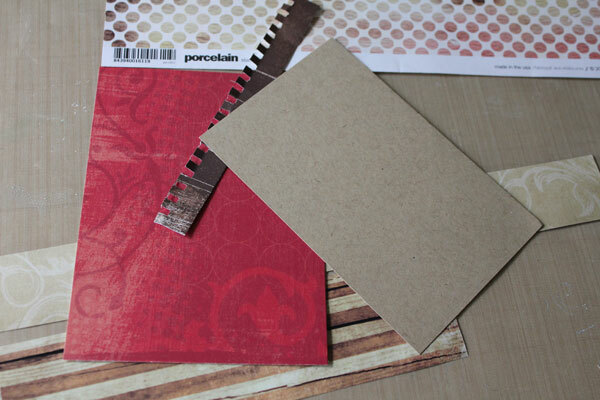 With that in mind I selected some scraps of paper and a background paper I have had for some time. I punched a small strip of the brown paper. Because I was sticking loosely to the other layout placing the other elements was easier than normal. 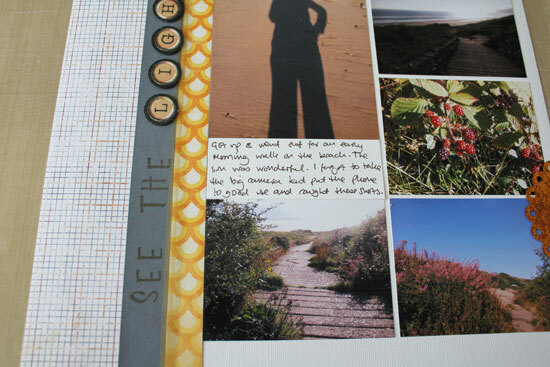 The journalling and title were added along with a little embellishment at the bottom left of the page. 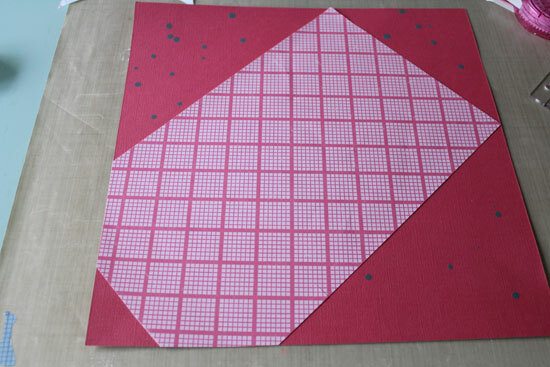 I love using a punched out shape from another shape like the star out of the circle. A variety of letter stickers were used for my funny title. And that little camera made it in there again in the top left grouping. It was so easy using a jumping off point for the design and I like the way this turned out. 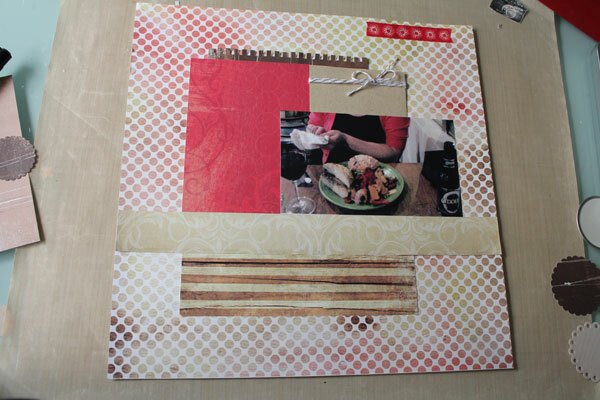 Welcome to another week of scrapbook walk throughs. More holiday photos this week. These are from the Cable Car Museum in San Francisco. 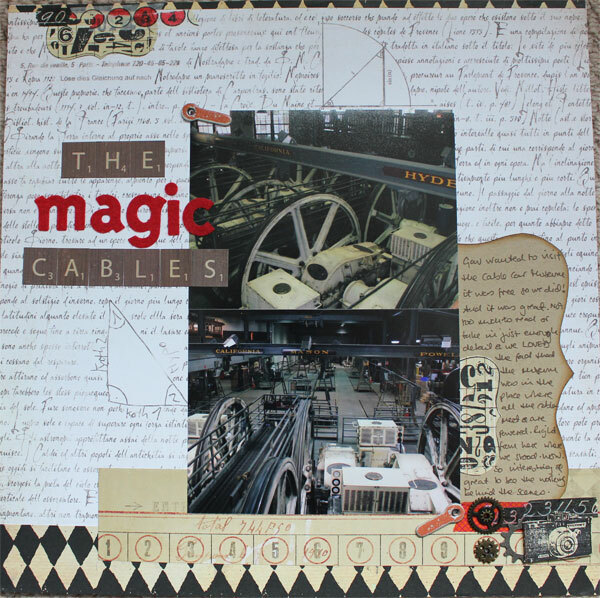 We were thrilled to find that the museum was sited in the building where the cables actually run from. We were really impressed by this geeks that we are. 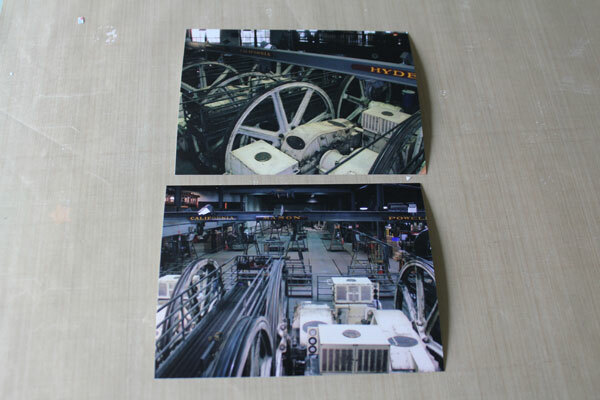 Because of the machine industrial feel to the photos I wanted the layout to echo that. 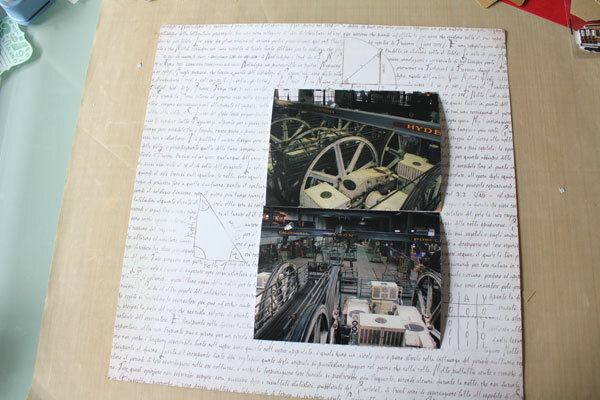 I was also thinking about the maths involved in these enormous wheels and pulleys and things so when I found this paper I knew it had to feature. It is an old one not sure they do it anymore. From the Basic Grey ‘Basics’ line. I just loved those papers. 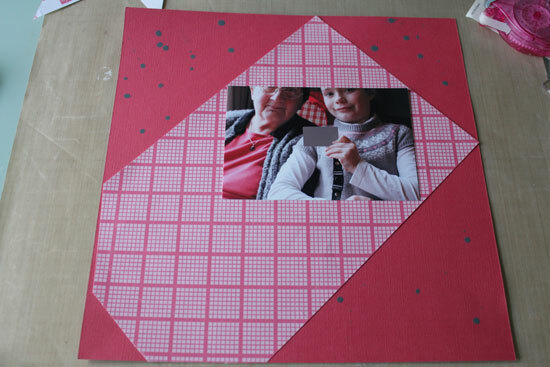 My only issue with using this paper though was that I didn’t want to cover up those little triangles.I just managed to fit the photos in between the triangles. 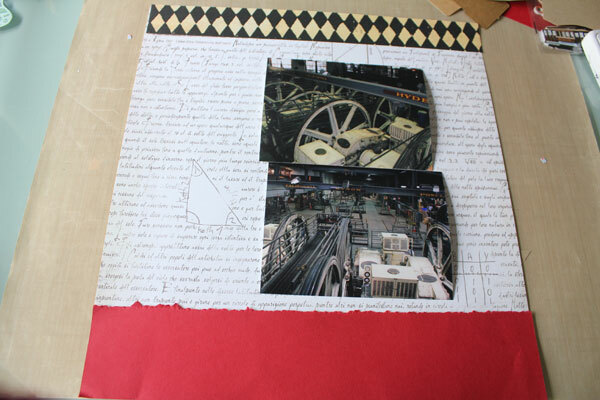 There is a yellow tinge to the wheels in the picture and I wanted to pick up that slight touch of red on the sign above the machinery so I picked a few other papers out. 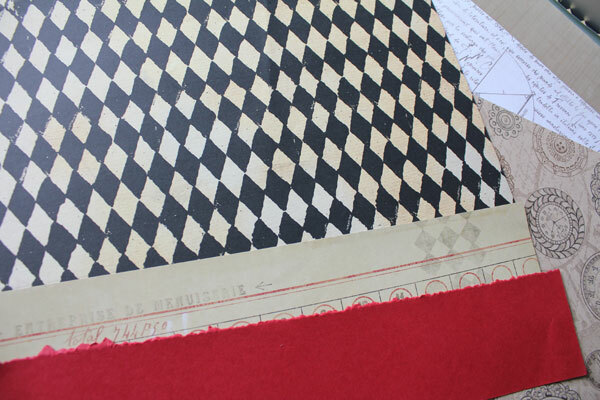 Had that harlequin pattern for ages. I tried a couple of combinations. 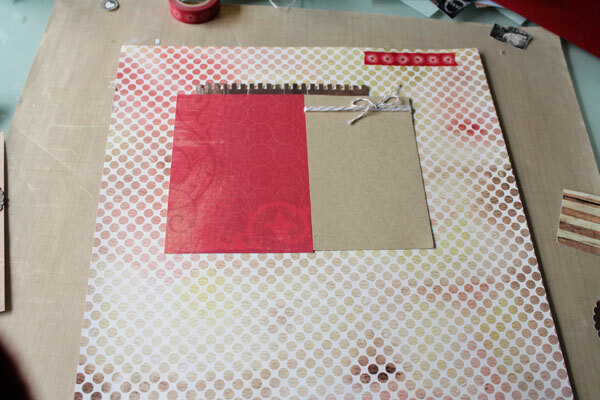 The red cardstock was too bold so I picked the second option. 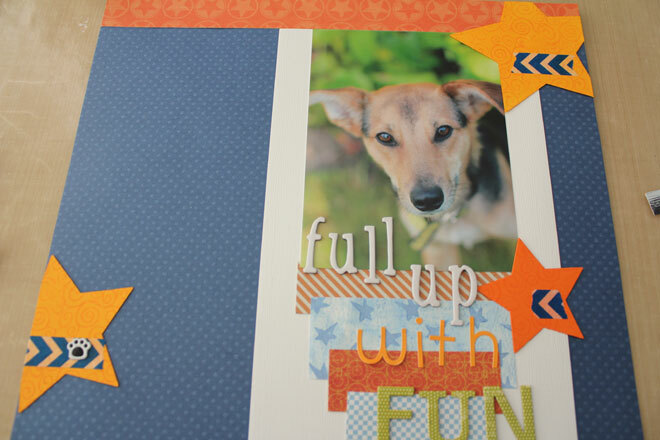 With numbers in mind I picked a journal stamp cut the stamped image in half fo a couple of embellishments. Then I needed to figure out where on the busy background I was going to write the story. 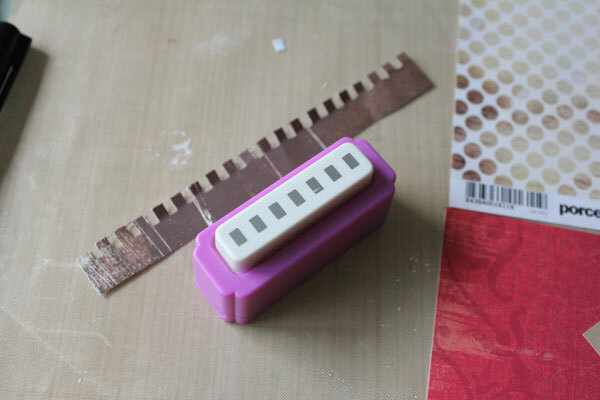 So I cut out a piece of kraft cardstock in a similar shape to the stamp. 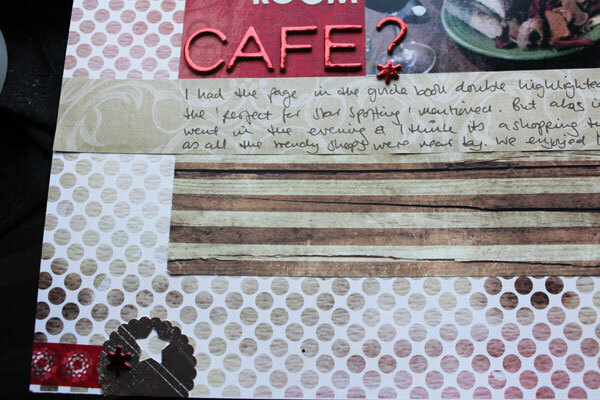 Then I added the title using old red felt ‘playroom’ Thickers and the scrabble style tiles from a sheet by Kaisercraft. 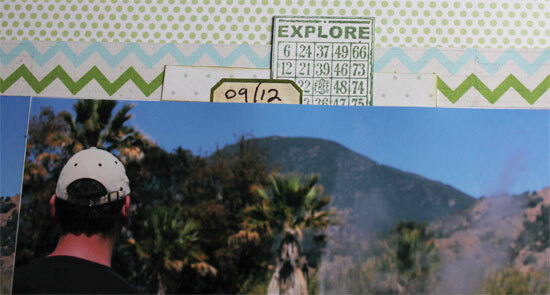 This little camera stamp is making its way onto all my California layouts. I got the idea from Shimelle. 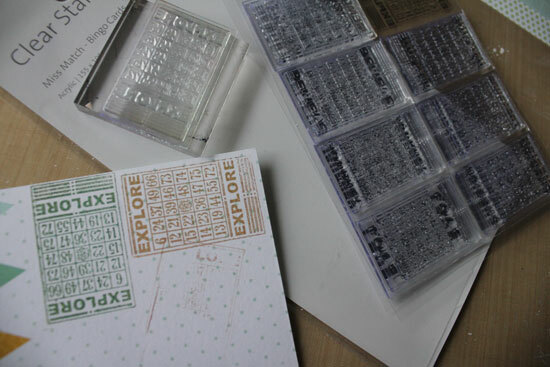 I bought the stamp set at a garden gift shop of all places. 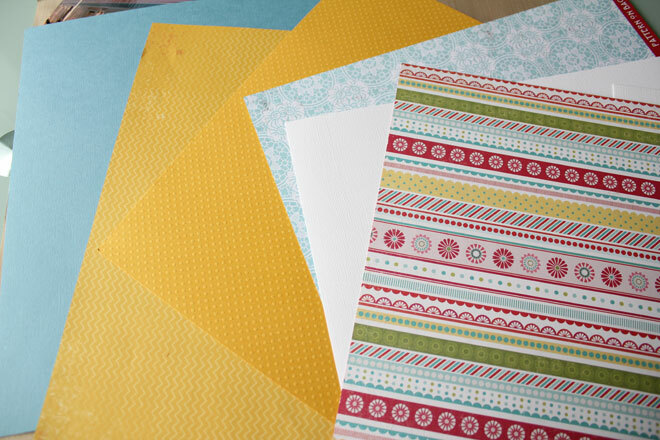 Some washi tape also went into the mix. 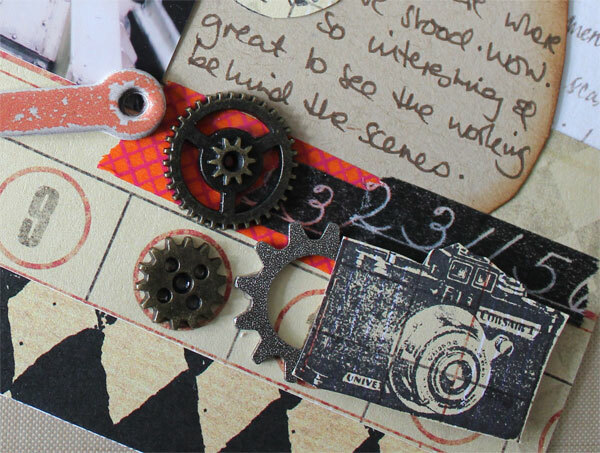 And you can see from the first photo above that a few Tim Holtz gears added the final touch of mechanical-ness! And there you have it. Really love how it turned out. 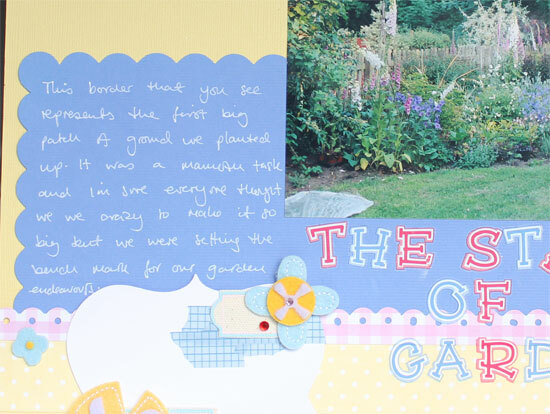 It is a busy page and that’s unusual for me but I think it captures the mood of the photos. 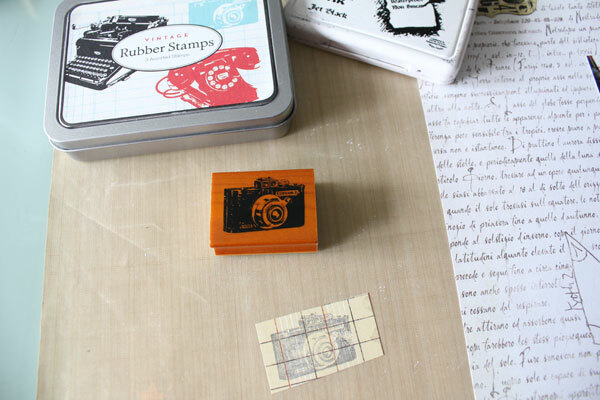 And I just love that camera stamp. Welcome to week thirty seven. 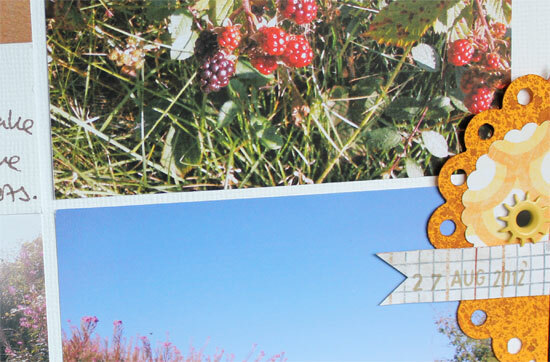 I got straight into scrapping holiday photos this week. 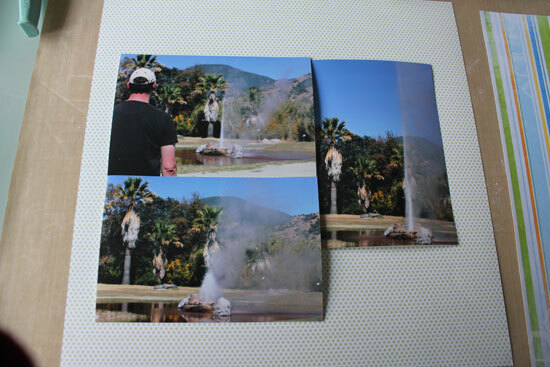 There were four pictures of this visit to see a geyser in northern California. 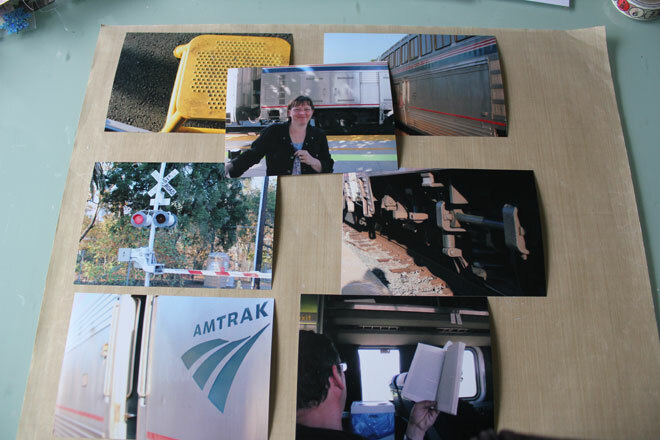 I whittled it down to three photos and picked out some papers. I am nothing if not predictable with paper choices. 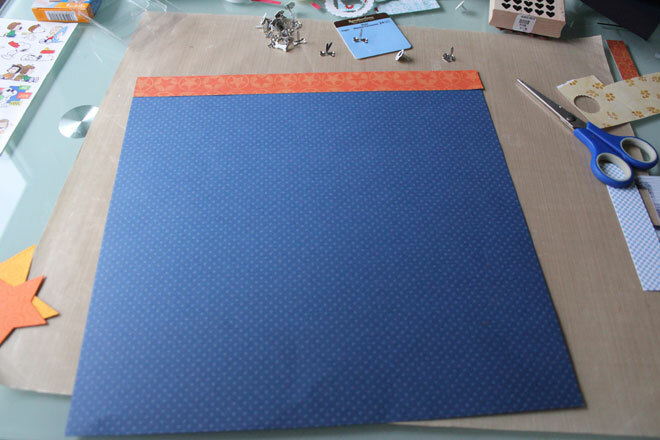 The photos have lots of blue and some green so guess what, I picked blue and green papers. 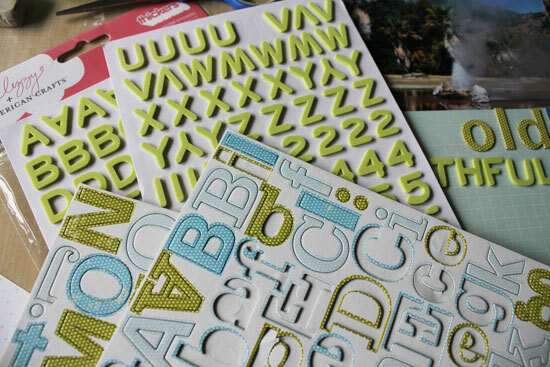 Also picked some letter stickers for the title. I tried the photos a couple of ways. 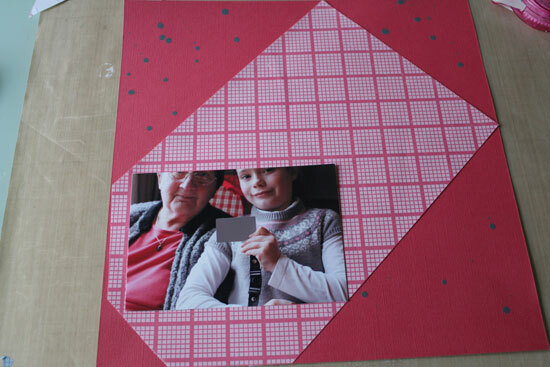 I used the spotty paper as the background and added a grid paper to the left of the bottom photo. 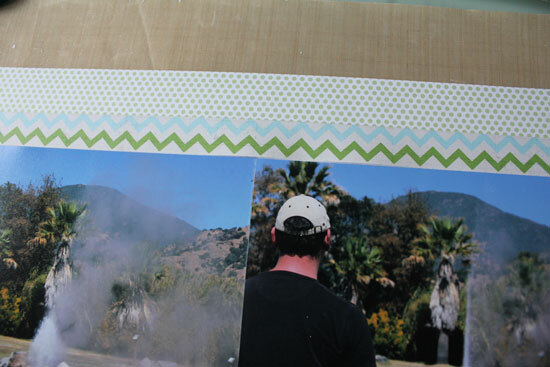 Then a strip of the lovely chevron\zig zag paper above the photos. As my writing was going in the square to the left of the bottom photo along with the title I added the title next to make sure I had enough room for the journalling. I used two different fonts. 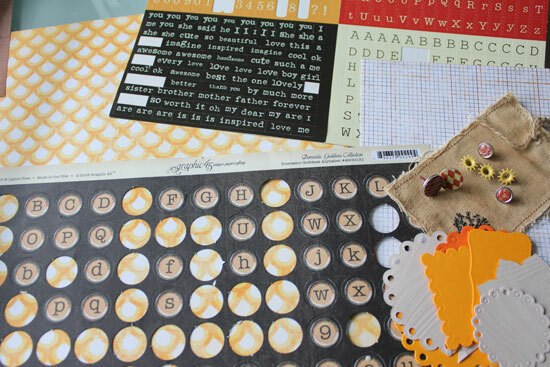 An old chipboard set and the brand new Dear Lizzie foam thickers from American Crafts. Popped the writing in next. 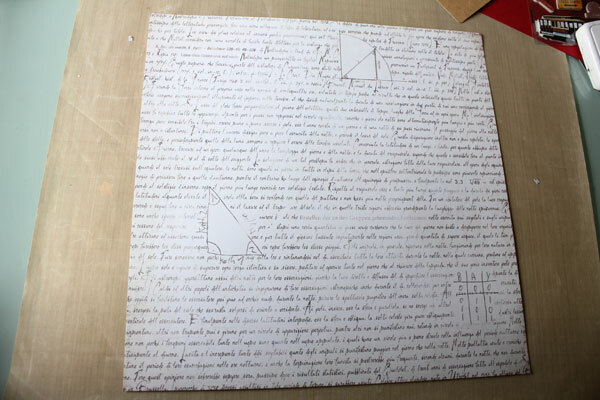 I got a bit twitchy when five words wouldn’t fit on the grid paper but I got over it….. almost. To cover that up a bit and balance the bottom it needed an extra something or other. 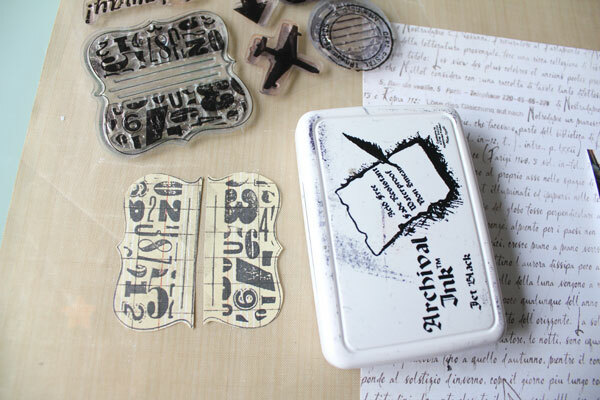 I found these great clear stamps that were unused from Kaisercraft. Thought the explore one fitted well. I stamped them using a couple of different inks to see which was best. I also added one to the top right along with another paper strip and a tiny label sticker for the date. A final touch was stamping the long arrows directly onto the layout just next to the title and on the middle right of the page. And that was it. Less is more again but I like it and it was a good story to tell. After couple of weeks break I am back with another walk through of a layout. 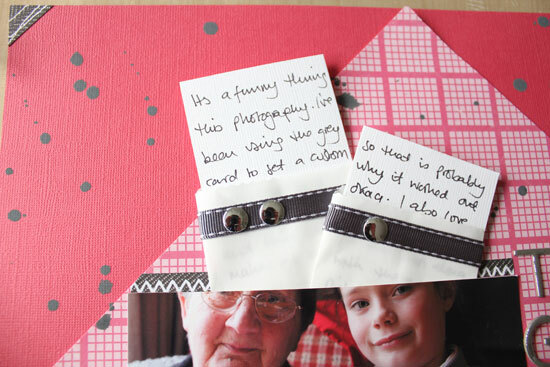 This was a great little story that popped into my head while I stared at the photo I printed a couple of months ago. Basically I was wondering why on earth I’d printed a picture that cut off the tops of my subjects heads but then an idea struck me. 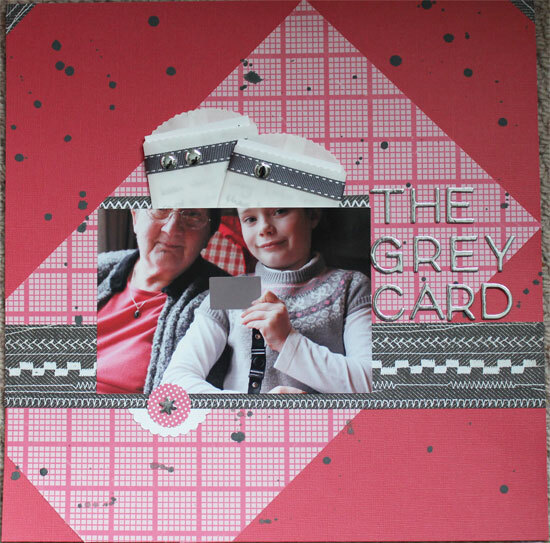 The moment I looked at the picture for inspiration about colour scheme I picked up on the grey in their jumpers, the pink and the that gingham pattern on the chair behind them. I found a piece of pink cardstock that I had already splattered with grey paint and then cast aside. This was perfect and the pink checked paper was also a perfect match. 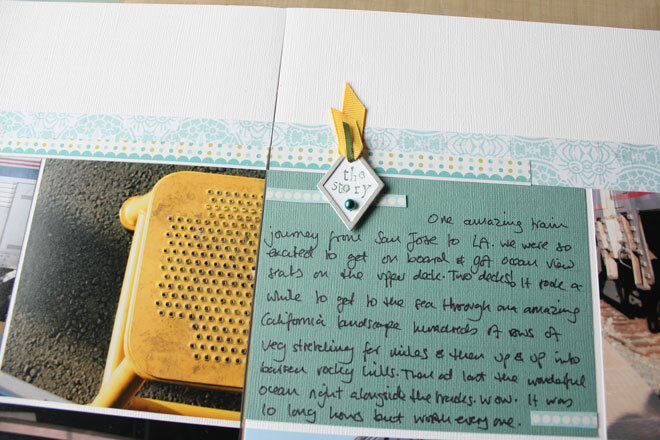 I just happened to place the paper at an angle on the card – something that usually makes me twitch! – but it seemed to work so I went with it. I like the fact that although the paper is at an angle there are still vertical and horizontal lines in the overall scheme. I added the photo in a couple of spots to see which worked best. I went with the second option. 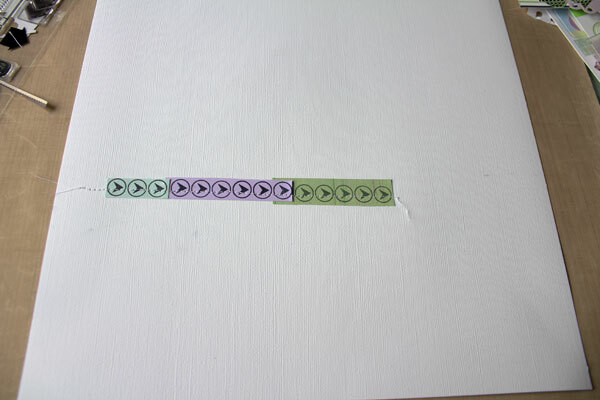 I also added a few grey paint splatters to the checked piece of paper. 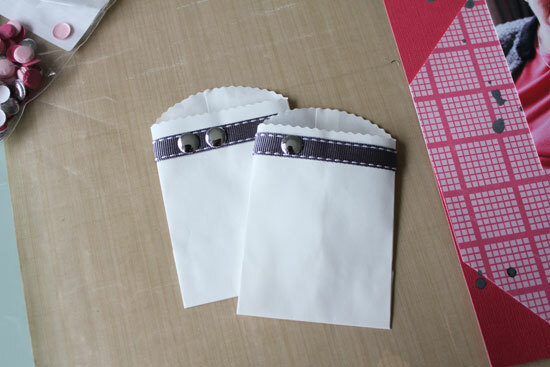 I had these sweet little paper bags and thought they would be good here so I pulled them out. A couple of options for decorating them up. 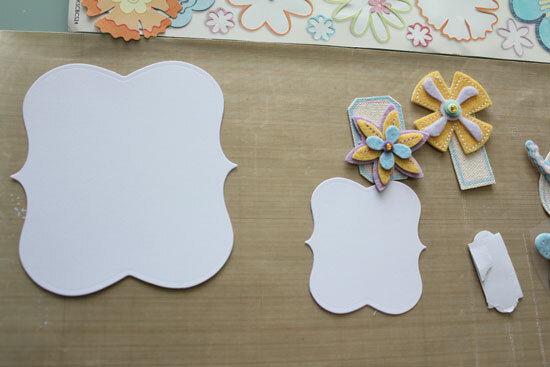 I liked the round mirror die cut paper brads best. 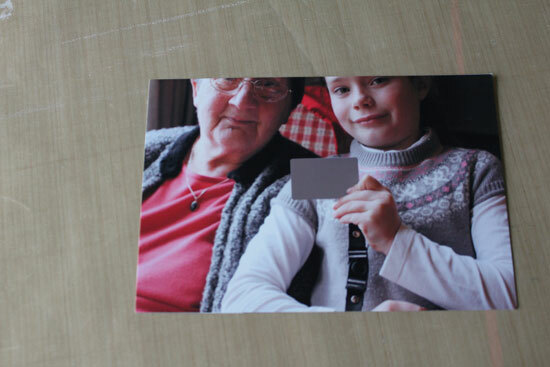 Only later did I notice their similarity to the metal brads on the strap of the grey card my niece is holding. I tucked the enveloped behind the photo. 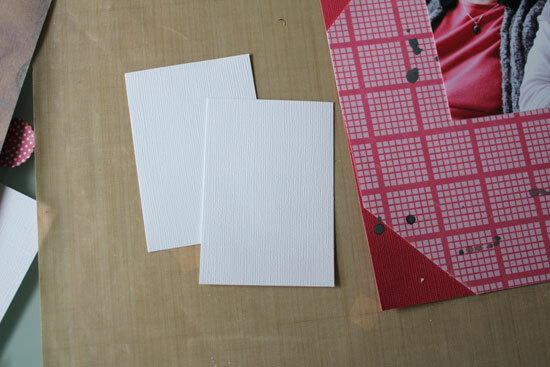 Cut out a couple of pieces of white card for the journalling cards. 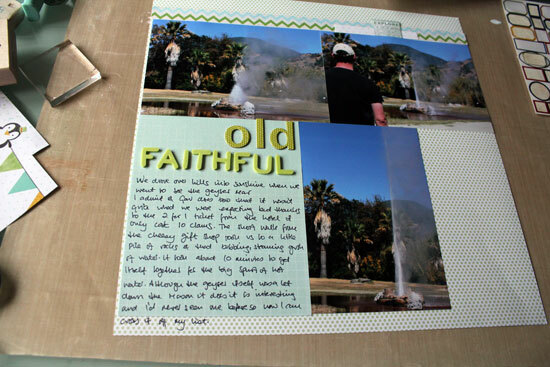 Added a strip of Basic Grey paper behind the photo as it looked a little plain. And the title in mirror Thickers – love those ones. 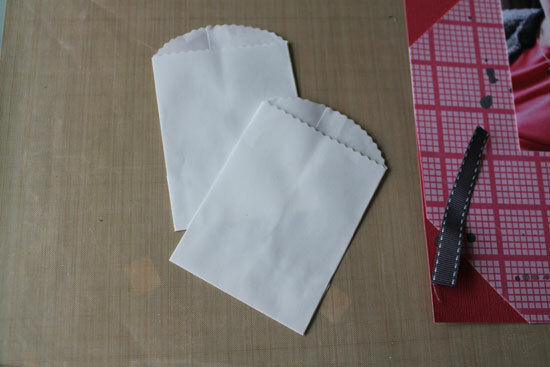 Here are the journal cards in the envelopes. Then as a final accent I added a scalloped circle smaller pink circle and a star from the alphabet set to complete a little triangle of mirror accents. And that was the page finished. Welcome to week thirty five. A story about how our current garden developed and grew this week. Here’s the photo. You know sometimes when you see a photograph you jest know what colours you want to work with. 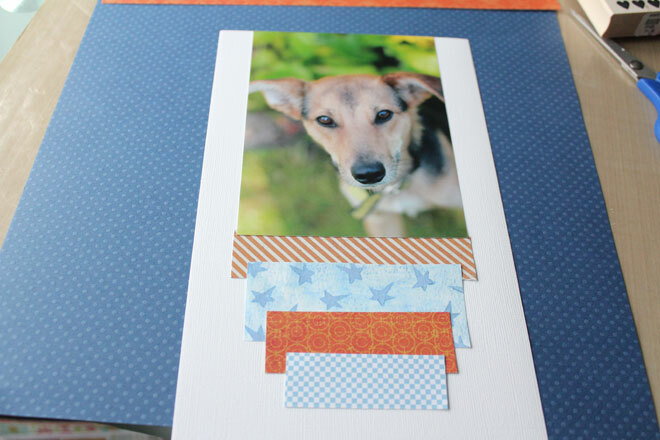 I wanted to use bright, bright colours with this photo.I went with a yellow background card and a blue pre-scalloped sheet cut down in size. 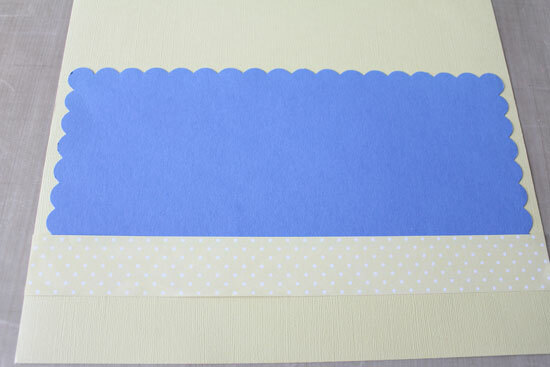 A similar yellow spotty paper went in the mix too. 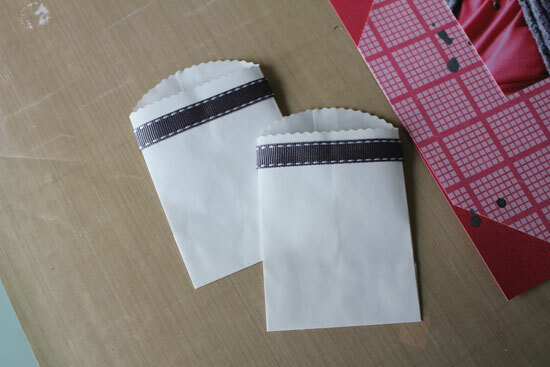 And a strip of pink and white gingham. 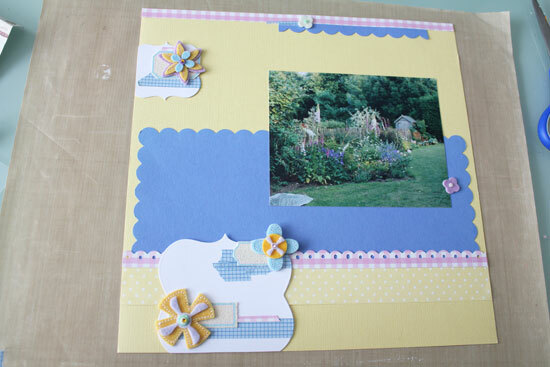 I cut the edge with a border punch. 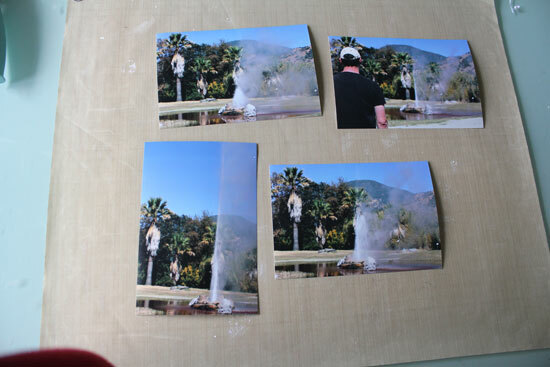 Here is the photo on the layers of paper. 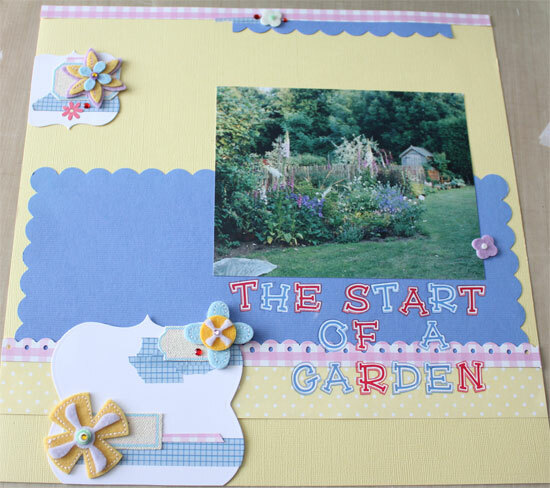 Since this was a flowery type layout I picked a selection of felt toppers from Basic Grey that I have had for ages and not got round to using. 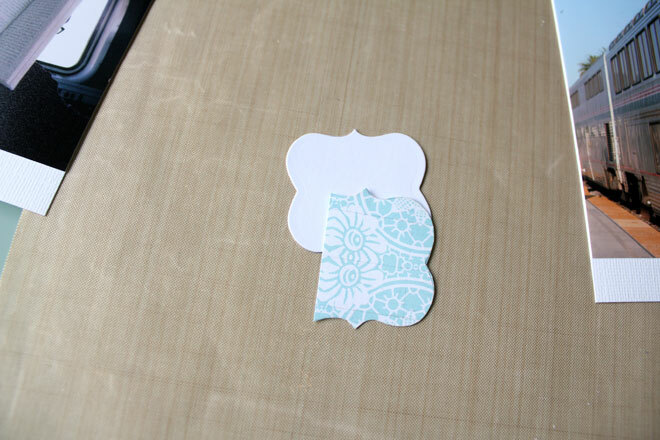 I also pulled a sheet of canvas labels and matched a flower to a label. 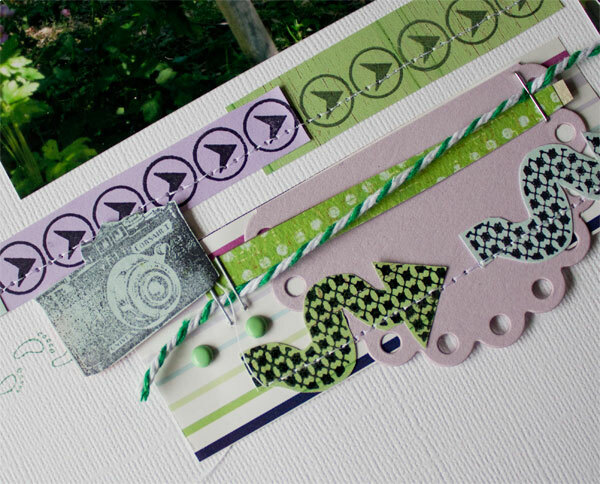 Also a few die cut shapes. 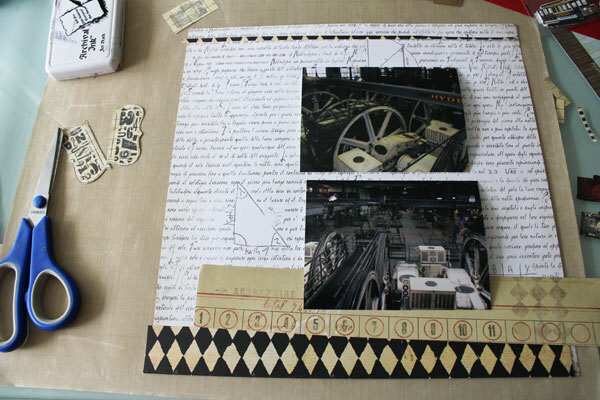 I then layered the pieces up. 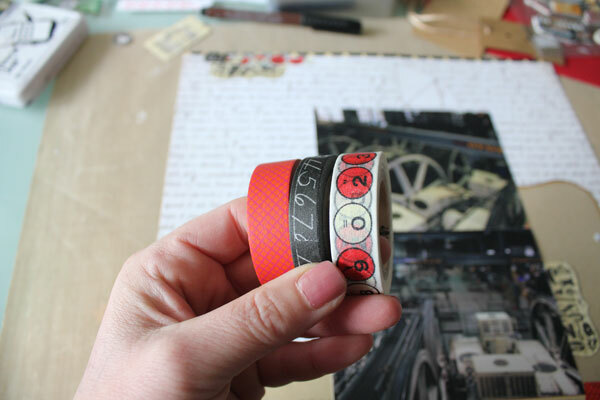 Some washi tape first. 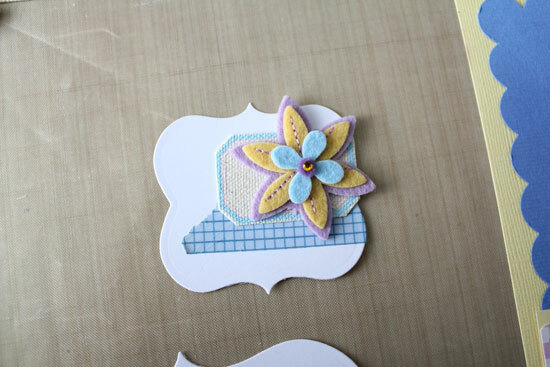 And then the flower on its canvas label. 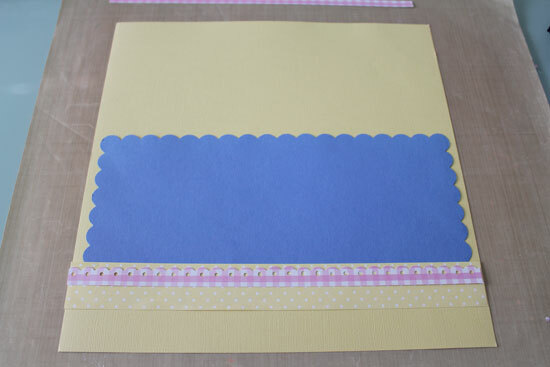 The two embellishments were added along with matching strips of paper along the top edge of the page. Next the title. 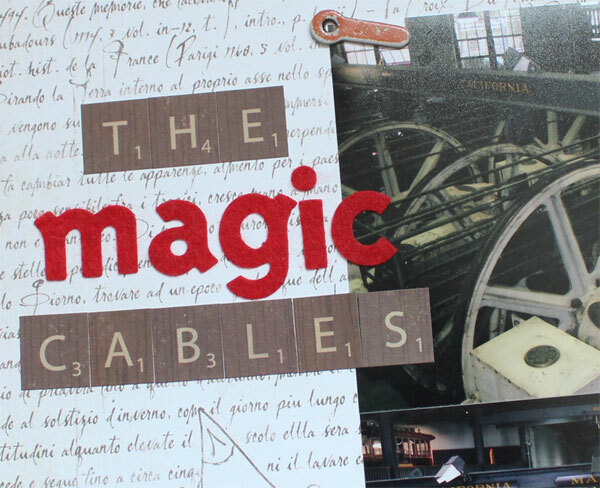 I was a little stuck for pink letters but I used this red and blue – rub ons from Anna Griffin – and then added a few dots of red about the page to match that red in the title. Sorry about the over-exposed photo! I used a white pen on the blue card for the story. And that’s it. Another apology as I didn’t get a decent shot of the completed page including the writing. Not a favourite I must admit. I don’t like that expanse of white on the bottom embellishment group but I tried something a bit different and do like that I have that little story told. Welcome to week thirty four. 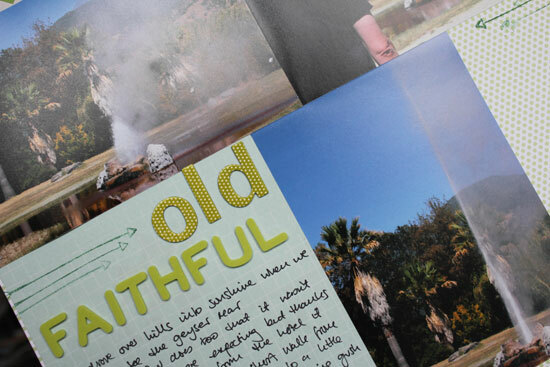 This week I did something very rare – scrapped photos I took a few days before. I don’t know if I just like to ‘age’ pictures or if I’m not inspired to create a layout immediately but this week I did just that. 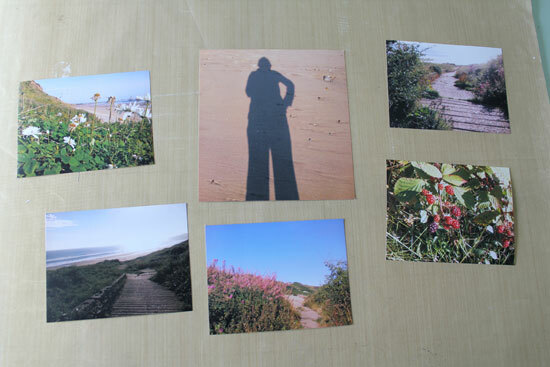 After I downloaded all the photos from the trip to the seaside I saw these and knew I wanted to tell the story. I printed the five smaller ones 3 x 4 and the larger about 5 x 6. I pulled out a few supplies. 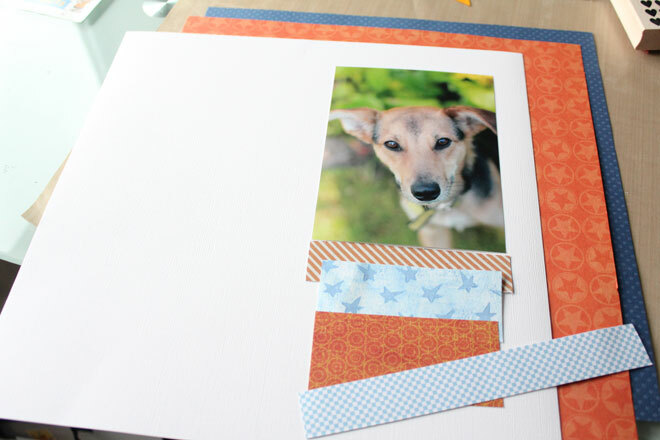 Orange featured as well as a sheet of Graphic 45 paper that had a blue orange grid on white card. 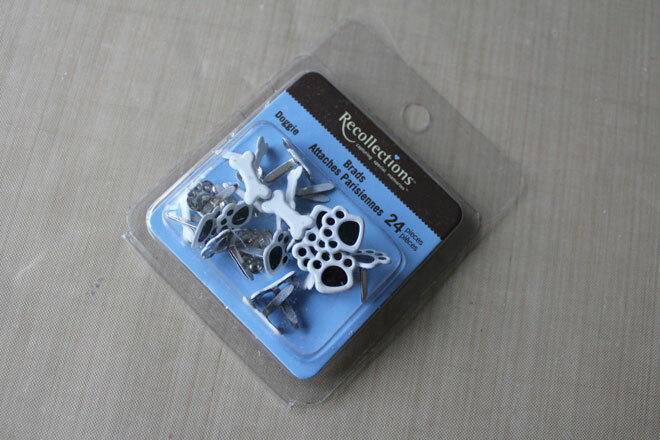 I also loved the little eyelets in the shape of the sun. 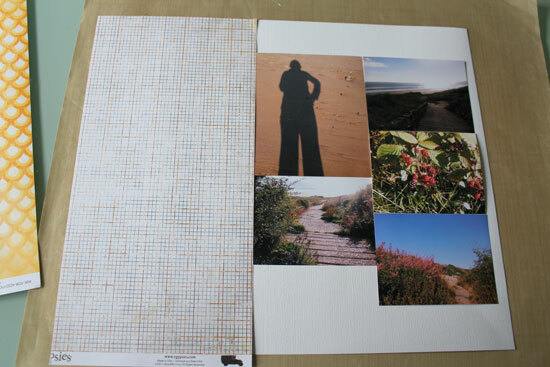 On white card I placed the photos and the grid paper to see if the composition worked. You can see I decided to leave out one photo as it just didn’t fit into the overall layout. 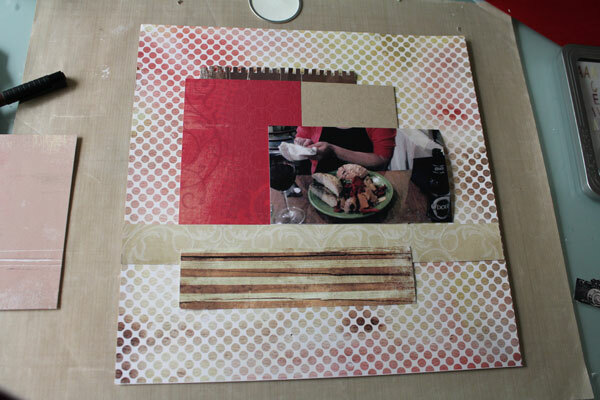 Then I tried the same layout but left a margin around the photos. 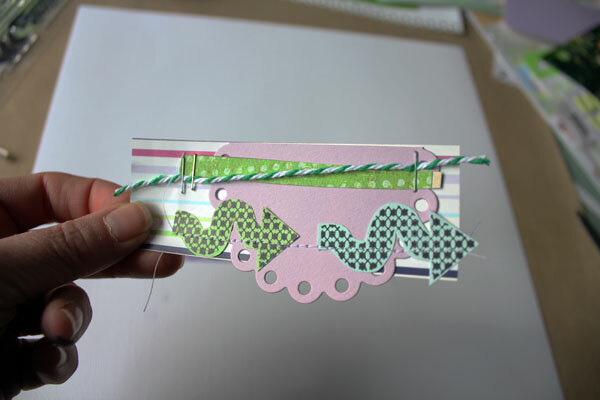 I’m a bit boring with margins….. have to have them! 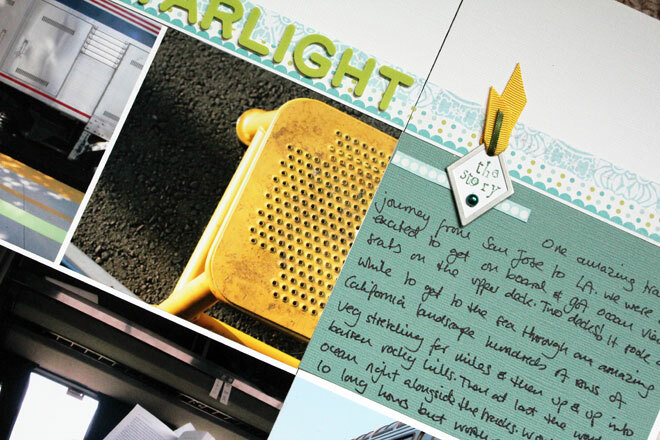 I also couldn’t decide whether to journal in the space below my photos or place the last photo in line with the bottom right photo and journal in the middle section. The upshot of this indecision is that I left the space until I decided. 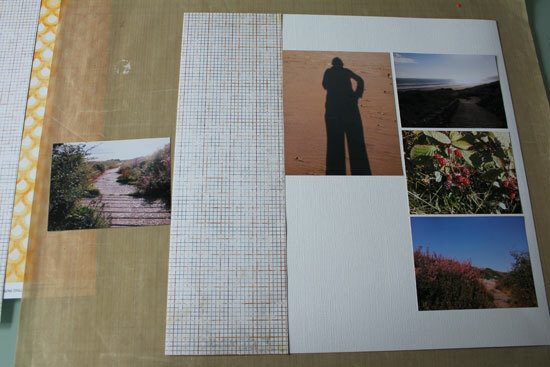 I added a strip of the yellow and white paper and a strip of grey card vertically next to the edge of my photos. 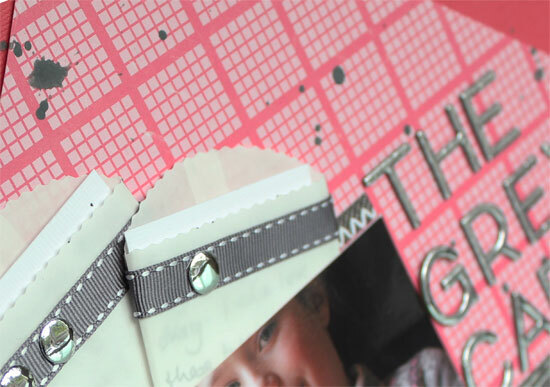 Then I wanted another layer and found a sheer ribbon which matched so I attached it using the sun eyelets threading the ribbon through to the back of the layout. 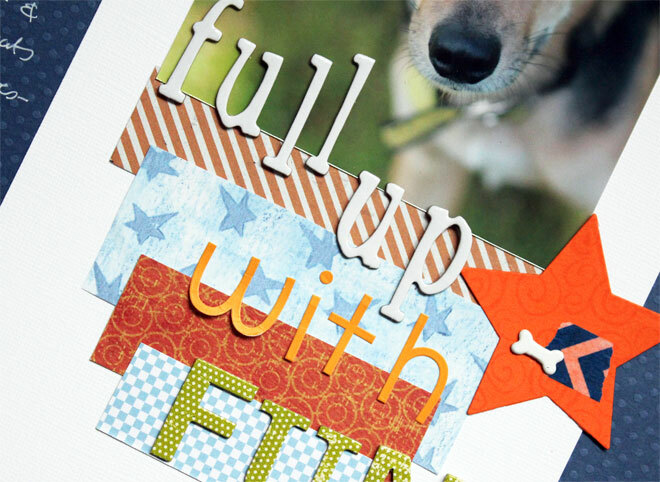 For the title I used some Graphic 45 type key alphas and stamped the first two words onto the card. At this point I decided what to do about the journalling. 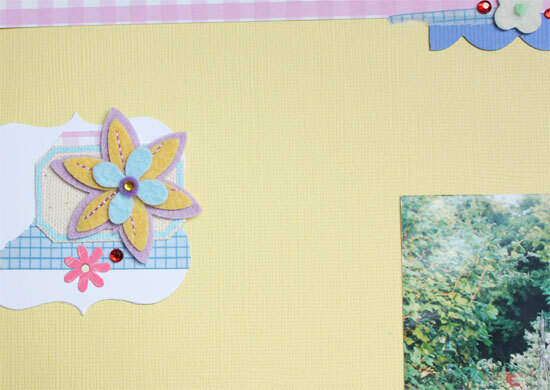 A couple of other little embellishments were added. 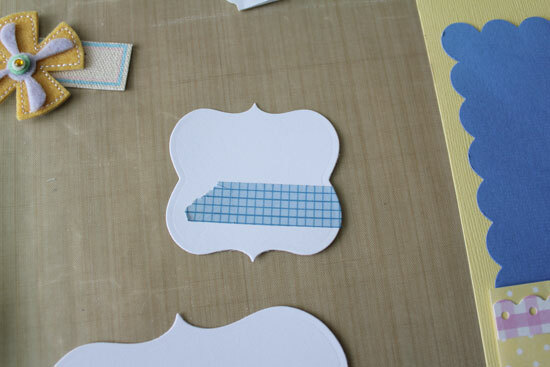 A die cut circle shape was sprayed with brown Dylusions ink and added to the right of the page. I added a tiny section of the leftover piece to the top left corner of the page too. 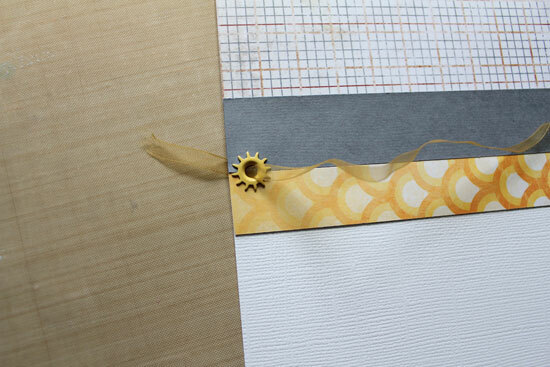 A little piece of the grid paper made my banner for the date and a circle of the yellow paper completed the layout. 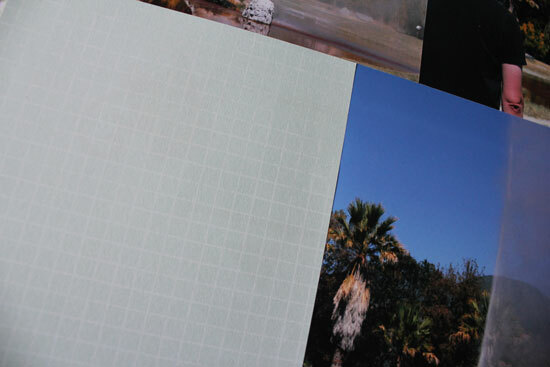 Grids of photos and less is more. I always go back to the same old same old. But I like it and even more that I got this lovely story told so quickly.